If you have a pet in your home, we’re sure that your days are filled with joy and the incredible amount of happiness this little one provides on a daily basis. If that’s true, you should always give your best to keep your pet healthy in the first place, which largely depends on the food it’s eating. If you want to know how to read the label properly and pick the right food for your beloved pet, just stay with us and keep on reading! What does a label tell you? Even though everyone says ‘when in doubt, read the label’, the truth is that pet food labels can be a bit tricky to decipher – especially you’ve recently got a pet. These contain a huge amount of information you need to pay extra attention to. You should also know that the Australian Standard for manufacturing and marketing of pet food (AS 5812 – ‘The Standard’) is what you should rely on since it provides detailed guidelines for pet food labelling in Australia. The words ‘pet food only’ have to be on the packaging, as well as an illustration of the head or the whole body of the animal species it’s intended for. There should also be a nutrition information panel, a nutritional adequacy statement, ingredients list, directions for use, date labelling, general consumer information, product branding, the name and the address of the company responsible for the product, weights and measures, a badge of honour, and the barcoding information marked on the packaging. How to read the pet food label properly? If you want to ensure that your pet gets the right diet, you should definitely read the label carefully in order to identify the ingredients and decide whether they’re appropriate for your pet or not. Pet food names should be informative and accurate so that they describe the food and its flavour in the best possible way. The feeding guide is also here to help you out so that you can decide what’s most appropriate for your pet. However, you should bear in mind that each pet is different, with its individual characteristics like life stage, metabolism, and lifestyle in general. This means that it may require more or less food than recommended, due to those characteristics. The quality of your pet’s food is essential for its health, so read the label attentively because the picture and words on the front don’t necessarily tell the whole story. You should know that whichever ingredient is listed first, it’s actually the main component of the food – so if you’re looking for meat-based food, make sure that it’s listed first. Also, you should look for specifically named meat, like ‘beef’, ‘lamb’, or ‘chicken’. If the ingredients are vaguely named, like ‘meat’ or ‘meat meal’, be sure to stay away from them. You should also skip animal derivatives and by-products in pet’s food. More and more people are turning to natural, additive-free food for their pets, which is always a good idea as it improves their health. Besides that, pet owners often switch to home-cooked meals or canned wet foods when their puppies or kittens start teething, but that’s actually a wrong approach. 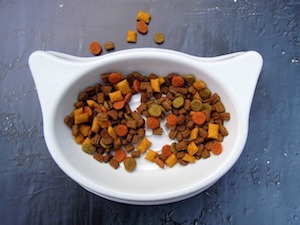 Many experts claim that dry pet food is still the best choice since their teeth will fall out much faster and therefore the whole process will be more stress-free for your pet. 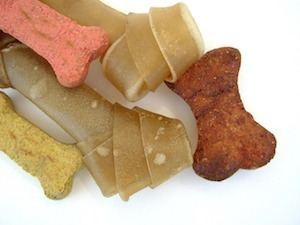 In my experience, dry dog food is the best option, simply because it speeds up the teething process. It helped my dog get over it in no time. 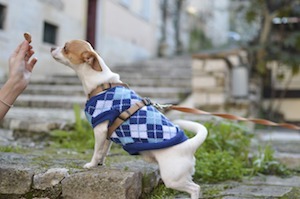 As you can see, there are many things you need to pay attention to when picking proper food for your pet. After all, only a healthy pet is a pet that will live a happy and long life, which is the only thing that counts, right?